Nicole Gordon. “Who Left the Kettle On?,” 2016. Oil on canvas. Tiptoeing between reality and the surreal, Nicole Gordon’s exhibition “magnified” presents a whimsical wonderland of phantasmagorical landscapes. In her paintings’ highly stylized alternate realities, people are strange, cartoon-like creatures with delightfully eccentric silhouettes and sceneries look like elaborate movie sets. In them, larger-than-life LEGO brick sculptures appear in natural settings. 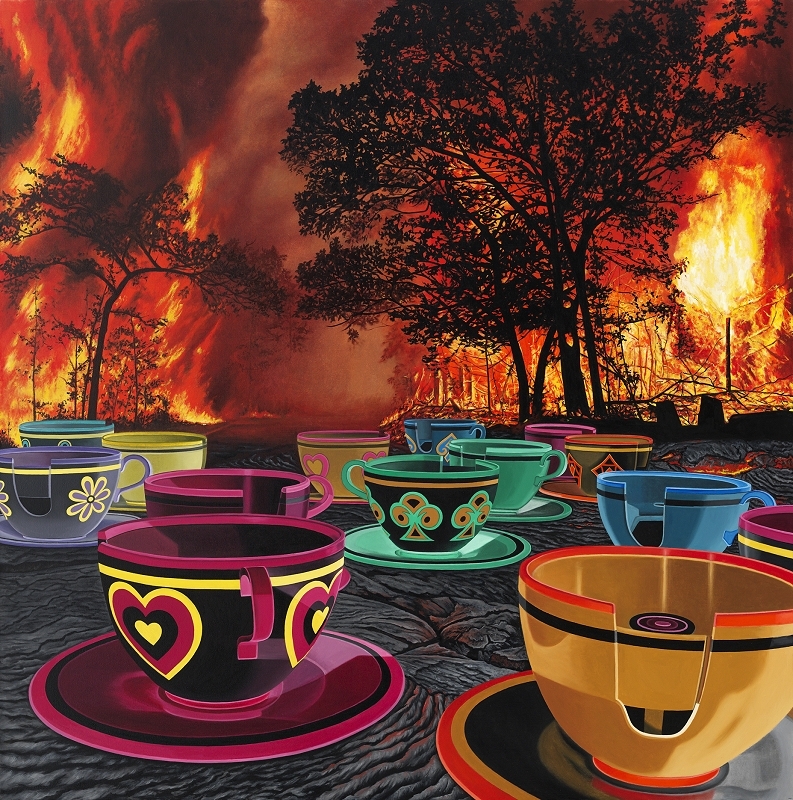 Oversized teacups reminiscent of amusement-park rides battle wildfire and pink flamingos wander in enchanted gardens. Gordon takes us down the rabbit hole of her imaginative worlds—a mash of reality and absurdity—with bright, vibrant colors that create unnerving, illogical sceneries representing the ultimate place of mystery and wonder: the real world in which we live. As powerful metaphors for our contemporary culture, these images offer insights into the way we experience the world today—reflecting the environment as a physical and emotional space in which the nature/technology binary is made readily apparent. 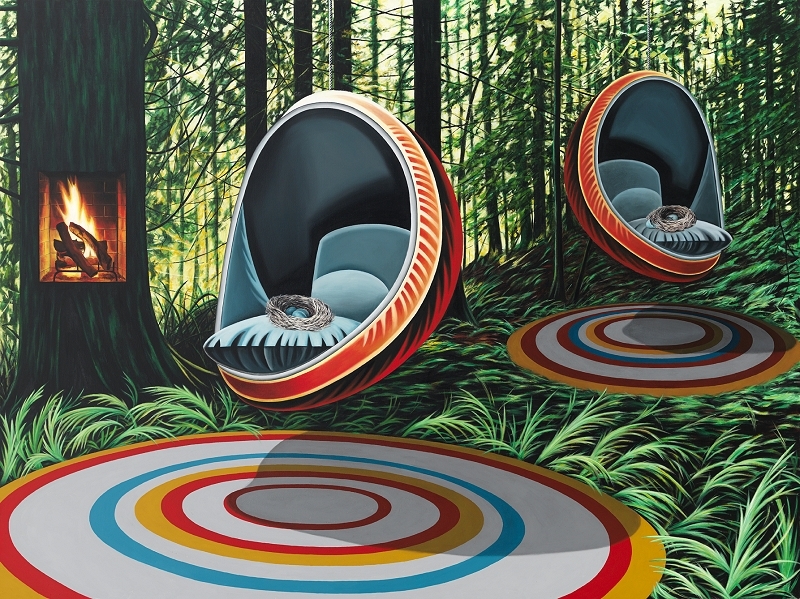 In an otherworldly space wherein painting and installation coexist, Gordon’s large-scale oil paintings hang alongside a wicker chair swinging from the ceiling hovering over a moss rug in which tiny polka-dotted mushrooms appear to grow. Allowing the viewer to physically enter into the narrative, the three-dimensional installation not only extends the paintings into the viewers’ space, it also challenges them to inhabit them. By breaking traditional barriers between painting and sculpture, the artist blurs the line between artistic mediation and pure experience. Seductive, idyllic habitats are juxtaposed with post-apocalyptic worlds, where after natural or man-made catastrophes, only scattered elements of society and technology remain. Out-of-context objects create bizarre, sometimes disturbing settings—physical remnants or enigmatic traces of technology or human activity that disrupt natural life. Nicole Gordon, “Finishing Touches,” 2015. Oil on canvas, 60 x 80 inches.